It's a fact: The Hornady® A-MAX® bullet design grew from a relentless application of everything we know about ballistics and flight characteristics. After all, match shooters demand perfection from their bullets every time they step on the range. The aerodynamic secant ogive profile, the sharp pointed tip and the unequaled concentricity of the A-MAX® design give it an extremely high ballistic coefficient for near perfection in flight. 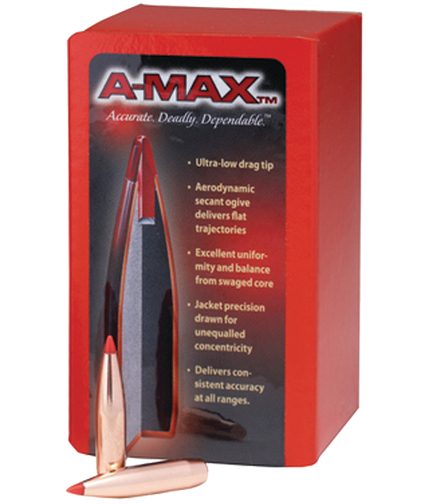 The A-MAX® bullet is the ultimate result of more than half a century of studying bullet performance. Ever aspect of accuracy has been designed into the A-MAX® bullet. From its polymer tip to the angle of the boattail, the A-MAX® bullet is engineered for extreme accuracy.